Habitat for Humanity is a nonprofit, ecumenical Christian ministry founded on the conviction that every man, woman and child should have a decent, safe and affordable place to live. Habitat builds with people in need regardless of race or religion. Habitat also welcomes volunteers and supporters from all backgrounds. Habitat for Humanity (HFH) works because it creates opportunity, not dependency. Habitat has partnered with over 500,000 families and built over 500,000 houses around the world. To learn more about Habitat for Humanity International, please visit their site. Habit for Humanity believes that every man, woman and child should have a decent safe and affordable place to live. We build and repair houses all over the world using volunteer labor and donations. Our partner families purchase these houses through no-profit, no-interest mortgage loans or innovative financing methods. 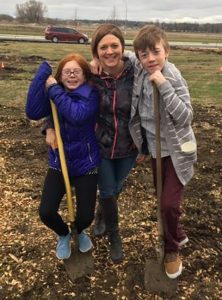 Partner families make an investment of “sweat equity” by helping build their own Habitat home as well as Habitat homes of others. The families then purchase the homes from Habitat, through no-profit, zero-interest mortgages, provided by local Habitat affiliates. Habitat families enjoy all the rights and responsibilities of any other homeowner. Through donations of materials, labor and financial support, the cost of Habitat homes can be minimized, so the monthly payment for a Habitat home is manageable for a low-income family. In fact, Habitat mortgages are generally far lower than the cost of renting the substandard and unsafe houses, apartments and trailer homes that Habitat part families so often leave behind. The resulting cash flow from families’ mortgage payments is returned to the Fund for Habitat, a revolving fund that is used to build more Habitat homes in their communities. Support local families in need. Visit the Donate section of this site to learn more about how you can help Habitat South Central Minnesota provide homes to those in need. Seeking to put God’s love into action, Habitat for Humanity bring people together to build homes, communities and hope.